We wanted to make a fun hack while also learning new things. Dad Simulator (Dadgotchi) was born from the love for Tomagatchi. 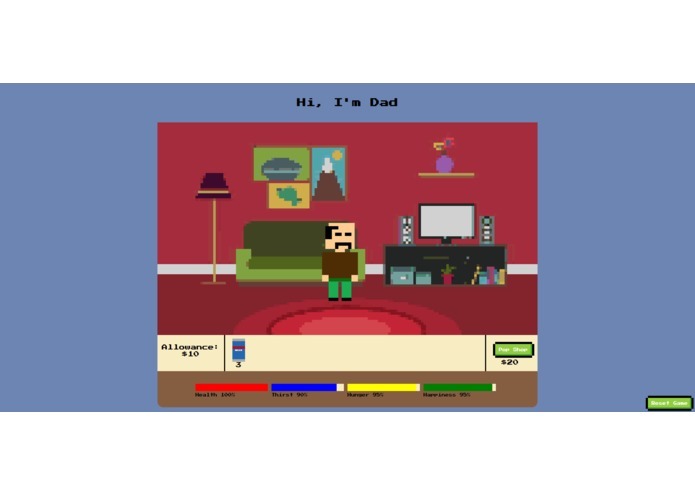 Provides the player with a virtual Dad in his room. You need to keep him happy and healthy with your allowance by using the Pop's Pop Up Pop Shop. He'll reward with Dad Jokes ya lil rascal. All of it is client side, using Phaser as the game engine and storing data in cookies. Making pixel art and the whole thing. A lot about game engines and Phaser. More dad jokes and fun.